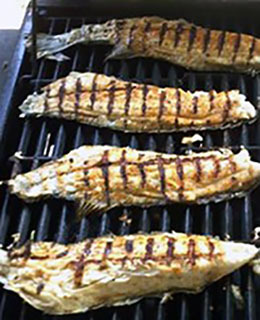 Thesimplicity of a grilled fish will make you question why you would prepare fishany other way. In a small bowl, combine the butter, garlic, cheese, Creole seasoning, olive oil and fresh herbs of your choice. Lay the clean fillets scale side down and brush generously with melted butter mixture. Close the lid and cook for 3 minutes. Again, generously brush fish with butter mixture. Close the lid and cook for 3 minutes. Repeat until flesh is firm and opaque; approximately 15 minutes for this size of fish. Remove and serve. For more drum fish recipes, please visit www.MissHomemade.com.